Read for This Week’s Study: Acts 1:6-8, Luke 24:25, Luke 24:44-48, Deut. 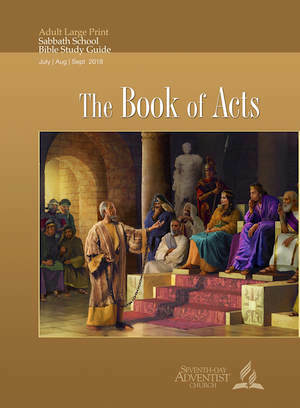 19:15, Acts 1:9-26, Prov. 16:33. The orientation of the mission. In Old Testament times, it was the nations that should be attracted to God (see Isa. 2:1-5), not Israel that should “take” God to the nations. The few exceptions (for example, Jonah) do not invalidate the general rule. Now the strategy was different. Jerusalem was still the center, but rather than staying and building roots there, the disciples were expected to move out to the uttermost ends of the earth. In the forty days He spent with the disciples after the resurrection (Acts 1:3), Jesus must have explained much truth to them about the kingdom of God, even if there was still much they didn’t understand, as their question in Acts 1:6 showed. They were familiar with the prophecies but could now see them in a new light, a light shed from the Cross and the empty tomb (see Acts 3:17-19). Read Acts 1:9-11. How does Luke portray the ascension of Jesus? What is the significance that there were two angels speaking to them (see Deut. 19:15)? The choice, however, was to be made from among those who had accompanied the apostles throughout Jesus’ ministry. Paul would later insist that, despite not having been with the earthly Jesus, he was nevertheless entitled to the apostolic office because his encounter with Jesus on the road to Damascus qualified him to bear witness to His resurrection (1 Cor. 9:1). Though admitting to be as “one untimely born” (1 Cor. 15:8, ESV), Paul refused to consider himself less qualified than the other apostles (1 Cor. 9:2, Gal. 2:6-9). Only the Twelve and Paul, then, were “apostles” in the technical, authoritative sense (Acts 1:25, 26); yet, in its basic, general sense as envoys or messengers, the term also could be used for other gospel workers (Acts 14:4, 14; Gal. 1:19).